After negotiations with Total Exploration & Production Angola and Sonangol, CGGVeritas says it has been awarded a five-year contract for the 4D seismic processing and imaging of annual and biennial monitor surveys planned to take place offshore Angola. Over 6000 km2 of seismic data from five of Total's deep offshore group of fields (Girassol/Jasmim, Rosa, Dalia/Camelia, Pazflor, and CLOV) in Block 17, which is operated by Total in partnership with Statoil, BP and Esso, are expected to be processed over the contract's duration. The large programme, including fast-track, base and monitor processing, will be shared between the CGGVeritas processing center in Luanda, which has served the Angolan E&P industry since 1999, and the CGGVeritas dedicated processing centre for Total in Pau, France, which has been operating since 2002. CGGVeritas has already gained considerable experience with this type of project, having successfully delivered 4D processing and reservoir characterisation services to Total in Angola Block 17 over the last decade (Fig. 1). The Luanda centre, with support and training from the dedicated processing centre in Pau, will draw on this expertise to apply a robust, optimised 4D processing and imaging workflow for each field so as to deliver high-end quality with a significantly reduced turnaround time. This will provide Total Angola's reservoir management teams with the information required and sufficient time for evaluating results to meet field development requirements. "We are pleased to have been awarded this significant contract which recognises our 4D processing excellence and proven track-record of developing pioneering 4D technologies. It also recognises our long-standing relationship with Sonangol and Total Angola and our strong local commitment to Angola. We look forward to extending our partnership with Sonangol and Total Angola to further contribute to improving hydrocarbon recovery via 4D seismic," said ceo Jean-Georges Malcor. The company has also begun acquiring the Tabasco 3D multi-client survey near the Kuparuk and Alpine oil fields on Alaska’s North slope. The programme has received high levels of industry prefunding and CGGVeritas is deploying two of its proprietary high-end acquisition technologies for the first time on the tundra to acquire the 133 square mile survey. The combination of high-productivity vibroseis acquisition (HPVA) and EmphaSeis broadband vibroseis is ideal for imaging the complex reservoirs in this area, and for characterisation of rock properties relative to the emerging shale oil resource play on the North slope. The seismic data will be imaged with anisotropic prestack depth migration at the CGGVeritas Calgary processing centre. Luc Schlumberger, executive vice president, multi-client and new ventures, CGGVeritas, said: "We are proud to see our Arctic crew return to the North slope this winter to acquire our first multi-client survey in Alaska. Through our long-term commitment to the Arctic and aggressive summer upgrade and maintenance programmes, we have the best equipment and expertise to safely deliver superior images of the subsurface to our clients, continuing our track-record of quality and environmental leadership over our last ten years of operations in the Arctic." Spectrum has commenced the next phase of its Brazilian equatorial margins programme taking the first shot on the 15,000km Foz do Amazonas survey. After completion of this survey in the third quarter 2012, Spectrum will have collected over 27,000 km of new long offset data over this highly prospective region. The programme is designed such that it covers sector blocks expected to be announced in the 11th license round in late 2012 and the programme is supported by industry funding. "Spectrum is excited to commence our third new survey in Brazil, adding needed data to an area that essentially has very little or no legacy data coverage at all. The excitement of the Zaudyus discovery in French Guiana has spurred excitement on the Brazil side of the Foz do Amazonas basin. This is Spectrum's second of six planned phases along the equatorial margin of Brazil and it is part of our strategic plan to grow our library in Brazil and Latin America," commented Spectrum's Richie Miller, evp North and South America. The seismic data will be acquired by the vessel Hawk Explorer with completion estimated during September 2012. The data will be processed at Spectrum's processing centre in Houston, with the final products scheduled for delivery during the fourth quarter of 2012. Spectrum is also partnering with CGGVeritas and the National Petroleum Corporation of Namibia (NAMCOR), in a newly-commenced 2D multi-client seismic survey covering the deepwater orange basin, offshore Namibia. The programme includes the acquisition of around 7000 km of long offset data covering both held and open blocks in the orange basin. A good level of prefunding has been obtained from companies to provide support for the programme. Seabird Exploration is providing the acquisition services through its Northern Explorer vessel which has recent experience of operating in Namibian waters. The data will be processed through full pre-stack time migration and include added-value products such as angle stacks and AVO products. Due to the frontier nature of the area, Spectrum will also be offering a 'fast model' pre-stack depth migration (PSDM) sequence, provided as part of the standard deliverables for the project. Final deliverables are expected to be available in June 2012. Offshore Namibia is considered highly under-explored. In an area covering more than 500,000km2 only 15 wells have so far been drilled, seven of these in the Kudu gas field area alone. The first exploration well (Kudu 9A-1), drilled in 1973, discovered the Kudu gas field. Geophysical Corporation has announced that its GeoVentures group has added an additional 8000km of regional seismic data to its Greater BrasilSPAN programme in the equatorial margin offshore northern and north eastern Brazil. To be processed by ION's GX Technology data processing group, this new data adds to the approximately 17,600km of data the company acquired in the region in 2009 and brings the total number of km in the company's BrasilSPAN portfolio to over 50,000. Recent major discoveries in West Africa's Ghana and Ivory Coast, which are geologically similar to Brazil's equatorial margin basins, have increased interest among oil and gas companies in the conjugate margin in northern Brazil. 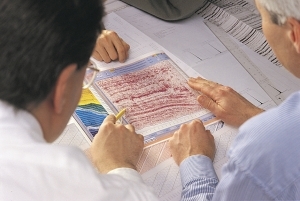 ION's Greater BrasilSPAN provides E&P companies with a better understanding of the orientation of the transform and growth faults and the deposition environment of the key basins from Foz do Amazonas to Potiguar. Ken Williamson, senior vice president of ION's GeoVentures group, commented, "Our BrasilSPAN programme provides E&P companies with a regional depth-imaged framework to better understand the hydrocarbon potential offshore Brazil. But the dataset is also of great value to E&P operators in Africa, as it reveals striking similarities in the structural framework of the petroleum systems on both sides of the Atlantic margin." The second phase of ION's Greater BrasilSPAN programme will be available in the third quarter of 2012, in anticipation of the 11th Brazilian licensing round. Finally, Cue Energy Resources has announced that acquisition of the Maari 3D seismic survey has commenced in permits PMP 38160 and PEP 51313 in the offshore Taranaki Basin of New Zealand. The survey comprises 254km2 of seismic data and is being recorded with the survey vessel Polarcus Alima. The survey will provide new data coverage over the Maari and Manaia fields and the Pike and Paua Prospects to the south. The data will be used to mature drilling opportunities for the Maari appraisal campaign planned for the 2012/2013 summer period. The survey is expected to take approximately 20 days to record, subject to weather. Text: Fugro has acquired EMU, an independent marine survey and environmental consultancy specialist with annual revenues of over €20m. Based in Southampton, UK, it also has premises in Portsmouth, Edinburgh, UK, Dinard, France and Perth, Australia. The company conducts ecological, geophysical, sediment sampling and hydrographical surveys, laboratory analysis, and provides environmental consulting and reporting services. It currently employs 150 highly-qualified and experienced surveyors, oceanographers and marine environmental scientists. EMU has a broad client base in the oil and gas, renewables, engineering contracting, marine aggregate and government markets. The company will further internationalise its business, supported by Fugro’s global network. The acquisition will contribute to Fugro’s strategy to provide its clients with fully-integrated solutions. EMU’s specialist services will further enhance Fugro’s capability to support clients’ projects from concept to completion. Fugro Geoteam has signed a letter of award with Statoil Canada for a 3D seismic survey offshore Newfoundland worth over US$ 40m (€32m). The survey will be undertaken using one of Fugro Geoteam’s industry leading C-Class seismic vessels during the second and third quarter of this year. Fugro Singapore has been awarded a major offshore geotechnical investigation contract by Reliance Industries on the East Coast of India. Fugro will perform geotechnical investigations, laboratory testing and foundation design studies to allow detailed design of subsea infrastructure for the Dhirubhai satellite fields located in water depths of up to 1850 metres. Fugro will be deploying one of its deepwater geotechnical vessels for this project. The value of the contract is approximately US$ 8m (€6.4m).